Bauer student Timur Daudpota, who is also in the college’s Wolff Center for Entrepreneurship, is working with supply chain management major Hamza Amir and computer science alumnus Jesus Hernandez on an e-commerce platform to sell their Kandy Kruisers products. Robert Dale Smith — a computer science major who participated in Bauer’s first 3 Day Startup last year — has already launched Mote Labs, a company that streamlines TV remotes into web browsers and secondary devices. Wolff Center for Entrepreneurship student Genevieve Simmons wants to teach the world to sing with an online platform called VocaLesson, which would link vocal instructors to students via video conferencing. Bauer students Hamza Amir and Timur Daudpota, along with computer-science alumnus Jesus Hernandez, are developing an e-commerce platform to sell their neon-colored skateboards Kandy Kruisers. RED Labs’ designated space at Melcher Hall is open 24/7 and fitted with Wi-Fi, Ethernet, flat-screens, storage lockers and unlimited coffee and ramen noodles. Along with the amenities, students get one-on-one coaching from mentors who have already launched successful startups. At weekly “Coworking Wednesday” sessions, which run from 6 to 9 p.m., students hear from successful entrepreneurs, lawyers, venture capitalists and creative/UX/design experts. “I think that what we are really trying to do is give these students firsthand experience at building something, at building a business, and providing them the resources to deal with real issues and questions that they must address,” he said. 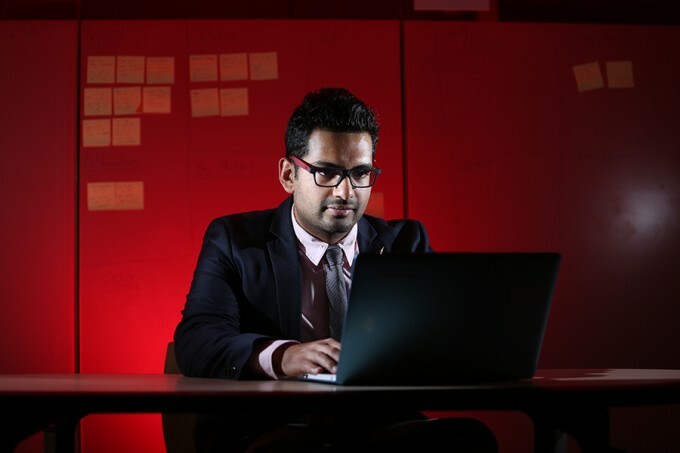 Panahi plans to continue RED Labs over the Fall 2013 semester. Course credit is optional. The only requirement is that at least one team member be actively enrolled at the university. RED Labs’ designated space in Melcher Hall gives participants room to create. 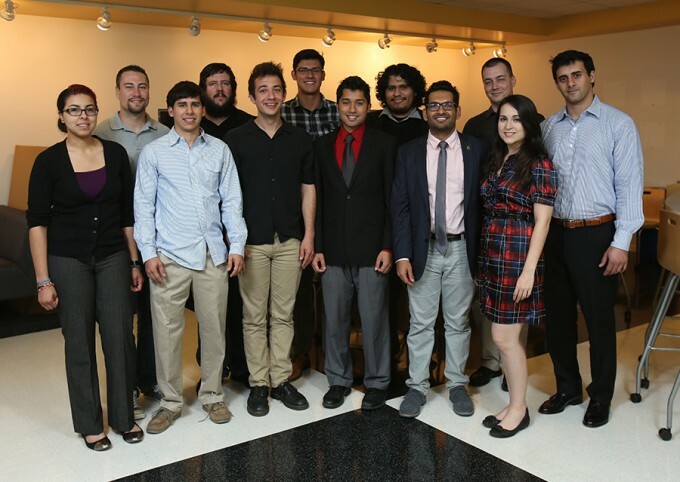 Pictured front row, from left, are Reyna Brizuela, Adrik Gregorian, Armen Suny, Hamza Amir, Timur Daudpota, Genevieve Simmons and Vicken Asadourian. Back row, from left, are Raul Giron, Iggy Harrison, Jose Pablo Ramirez Pradilla, Jesus Hernandez and Robert Dale Smith.